MCR Guard has been battle tested in conflicts around the world and offers excellent permeation resistance to most acids,aldehydes, alcohols, amides, bases, esters, and ketones. These gloves are produced domestically with a unique solution dipped process. No other process can achieve such a tight molecular structure, the key to chemical impermeability. MCR Guard is made with the finest Butyl rubber for outstanding protection. The CP25 is a 25 mil smooth finish glove that features a rolled cuff that is 14 inches in length for added protection. 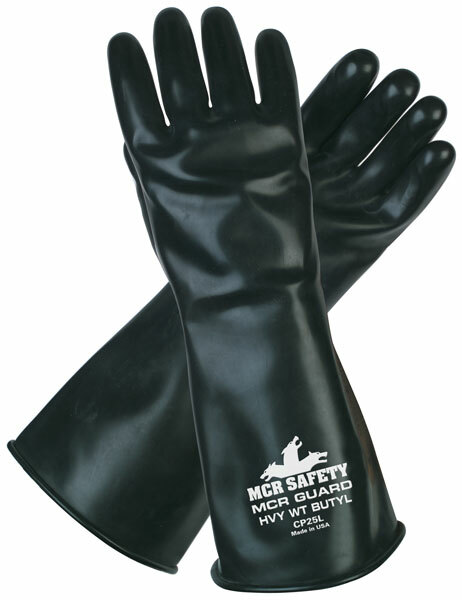 MCR Safety's Butyl glove options are anti-static.